For quickly killing “the ants from Hell – the Red Imported Fire Ants” nothing is faster than the EPA approved Earthfire Injection system. The active ingredient, Resmethrin, is a rapid knockdown product that once heated in the Earthfire gun and injected works to quickly fumigate the mound to eradicate the colony in seconds. It has a relatively low order of toxicity to mammals and is used by a number of governmental agencies (Air Force bases, etc.) in high traffic areas where immediate kills of fire ants are needed. Don’t be misled or waste your money by believing the false advertising claims of chemical companies or national pest control companies that their fire ant baits, drenches powders and dusts can eliminate fire ant problems! FACT: The major chemical companies have made billions of dollars with their control methods and yet the fire ants continue to spread. The Earthfire injection system is a patented (additional patents pending), sub-surface thermal fogging apparatus and chemical. When properly applied to individual mounds it will reach all of the ants within the colony in a matter of seconds, to its deepest levels, to affect a 100 percent instant kill. When flooding occurs the resilient fire ants will form a ball to protect the queens. 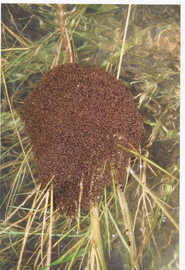 This basketball- sized colony, about 11 inches wide and containing over a hundred thousand fire ants, found support above the waters on tall reeds. FACT: Earthfire is the only fire ant eradication product, when properly injected into a mounded colony ---- which a minute before had been boiling over with thousands of fire ants ---- that you can sink your bare hands into and not be stung. FACT: When properly used Earthfire is the only product that takes just seconds to begin killing all of the queens and the hundreds of thousands fire ants in the colony including the alates (the winged male and female ants) before they can fly off to breed. The other products take days, weeks and even months to achieve varied results allowing the alates time to fly off and breed future colonies. FACT: All contact poisons such as drenches, dusts, cold foams or liquid injections must come in direct contact with all of the queens in order to kill them. At best they reach just the top layer of fire ants. By the time that happens the queens and the broods deeper down in the colony have been moved to safety. Underground, fire ants can evacuate an entire colony in about 45 seconds through their tunnels when they feel threatened, to begin a new colony several feet away. In just seconds, Earthfire’s thermal fog has traveled rapidly and deeply through the entire colony, including all escape and foraging tunnels before the fire ants can escape. FACT: Studies by fire ant researchers and universities have revealed that many of the highly advertised baits and chemicals are only perpetuating the further life of the fire ant colonies. The surviving queens simply move and establish a new colony continuing to lay eggs at a rate of 1,500 or more every 24 hours. Example: 100 queens in a colony can equal 150,000 eggs in one day – 54,750,000 eggs a year. Earthfire does not allow any queens to continue laying eggs because they are already dead or dying within the seconds it took you to read this sentence. FACT: Fire ant baits quickly lose their effectiveness when they become damp or when it is too hot, which happens quite frequently in the fire ant belt states where fire ants thrive. Earthfire can be used rain or shine with the same quick effectiveness in killing the entire colony. Earthfire has a long shelf life. FACT: One costly package of the competitor's bait gives you just enough to treat six mounds. It takes several gallons of the competitor's drench to treat just one mound AND IN BOTH CASES YOU WAIT SEVERAL WEEKS OR MONTHS TO SEE THE EFFECTS. The easy – and fun – to use Earthfire injection system uses only 1/3 oz. to 1/2 oz. of pre-mixed chemical to quickly and completely kill a small to medium sized mound. Used as instructed a case of the Earthfire chemical (12 cans) can wipe out up to 300 plus colonies – small, medium and large. FACT: One well-advertised fire ant bait says that when their product “kills the queen, the colony dies.” What they don’t tell you is most fire ant colonies have multiple queens, some with hundreds of queens in just one colony. The net result is that you may kill one or two queens with their bait and the rest simply evacuate the colony to start a new one several feet away. In reality you’re simply chasing the same colony around your property – and wasting time (weeks and months later to see the effects) and money. Only by using the Earthfire system can you quickly and effectively begin destroying all of the individual mounded colonies on your property, containing millions of stinging fire ants, safely and in just seconds of being injected into the mound. No other fire ant product or process can make that claim and prove it. FACT: Unlike fire ant baits, dusts and drenches which can harm eco-friendly insects, Earthfire, when properly applied, is species-specific killing only the deadly fire ants. Biologists and entomologists appreciate Earthfire because it is ecologically and environmentally safer than broadcast treatments.